Every time the The Samurai Of Prog come with a new release I ask myself again the question can they beat their former releases? So when I got On We Sail in my mail box I had great expectations. The album starts very strongly with the title track. It was written by keyboard player Kerry Shacklett (Presto Ballet). Therefore it not surprising for me to hear musical elements that reminded me of Emerson, Lake & Palmer. But then again, also the sound of Kansas in the seventies era . The strong violin playing of Steve Unruh is the main reason for this comparison. But I like it all the way. Wow! it's just an amazing piece this opening tune. And what about the second track Elements Of Life? Again, amazing music can be heard. Think for example about England. This time around is was written by keyboard player by Octavio Stampalia of Jinetes Negros. It is a bit more dynamic than the opening piece and has more power. Steve Unruh's flute provides a tonal impact, and dramatically it goes on, powerful with a lot of drive and energy. Great retroprog! It is so varied and somehow also links with Genesis to more contemporary bands like Spock's Beard or Arena. The sound of the organ is again magical on this piece! For the next track, titled Theodora, keyboard player Lucas Scherani (Höstsonaten, La Coscienza Di Zeno) and singer Michelle Young find a perfect combination in each other and come up with a composition which reminded me of the music you can find nowadays on a lot of Kaipa albums. But also Renaissance came to my mind. As always a track written and performed by David Myers can be find on an album made by The Samurai Of Prog. Ascension is this time around not a piano piece but a song which has a band approach. It's a great instrumental with a lot of strong parts played on the flute, piano, electric guitar and Mellotron. Again superb music! The typical Kansas violin can be heard again on the next track. But also strong guitar and flute playing is present on Ghost Written as well. It is a great track which entertains you all the way. It was written by Unitopia keyboard player Sean Timms and features the vocalist from this band as well. Namely Mark Trueack. The song is followed by The Perfect Black written by keyboard player Oliviero Lacagnina. It's a strong instrumental with strong neoclassical influences. Great flute and keyboard work is notable! But also fine playing on the acoustic guitar makes your heart beat faster. All in all I love it all the way! For the next piece Growing Up again Kerry Shacklett comes to the fore. Here the influences of Jethro Tull are very much in the spotlight. Vocal wise but also flute wise. Sounding like this band doesn't mean it is a not a good prog tune. Because it is. Most of all because of the fine guitar and violin parts. After the fine piano solo on Over Again by David Myers, the album ends with Tigers, which was composed by the recently deceased keyboard player Stefan Renström. The longest piece on the album is a perfect way to end. The former Simon Says singer Daniel Fäldt was invited to lend his voice. Thus, the track sounds like a legacy of old Simon Says days. For lovers of neo progressive rock a real stunning piece of music can be heard with amazing guitar and keyboard parts. But also fans of Rick Wakeman will be entertained all the way!. On We Sail is the fifth album of Marco Bernard (basses), Steve Unruh (vocals, guitar, violin, flute) and Kimmo Pörsti (drums). And once again after releasing Undercover (2011, see review), Secret Of Disguise (2013, see review), The Imperial Hotel (2014, see review) and Lost And Found (2016) the managed to come up with an amazing sounding album. With the help of many contributors (too many too mention) they once again succeeded in releasing one of the best progressive rock albums of 2017. The album is an example of a successful retroprog sound with a pinch of crossover and symphonic prog. Once again housed in a beautiful cover made by Ed Unitsky you just can't ask for anything more. The last two efforts already gott the highest rating possible. And for this release I can only again give the maximum of stars available. Because you probably don't hear it any better than this! 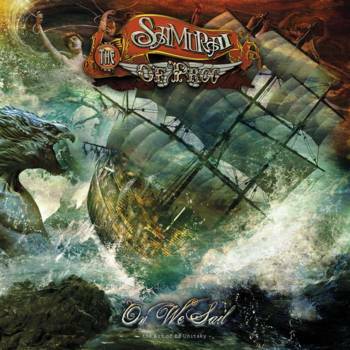 On We Sail is a must have for all lovers of progressive rock!